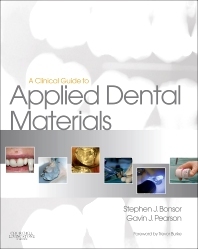 A new textbook on the practical use of dental materials suitable for undergraduate dental students and qualified dental practitioners taking post-graduate exams in dental materials, restorative dentistry, operative techniques, advanced conservative dentistry, endodontics, removable prosthodontics and implantology. Mr Steve Bonsor is a general dental practitioner working in private practice in Aberdeen. He graduated from the University of Edinburgh in 1992 with Honours and won the Hepburn Prize for the best senior student in dental hospital practice. In 1997, he gained a Diploma in Post Graduate Dental Studies from the University of Bristol. Also in that year he was appointed a part-time clinical teacher at Dundee Dental Hospital and School and Honorary Clinical Teacher at the University of Dundee in the Sections of Operative Dentistry, Fixed Prosthodontics, Endodontology and Integrated Oral Care and taught there on a part time basis until 2006. He was admitted as a member to the Institute of Learning and Teaching in 2001 and awarded Fellowship of the Higher Education Academy in 2007. He completed a Master of Science at the University of Bristol graduating in 2008. He is heavily involved in postgraduate dental education having lectured throughout the UK. He has also extensive experience of tutoring the dental team, in particular dental nurses. He has recently been appointed as an Honorary Clinical Lecturer at the University of Edinburgh. He is currently actively involved in research having published original research articles in peer reviewed journals with his main research areas being Photo-Activated Disinfection and the clinical performance of dental materials. He is a referee for a number of dental journals. He is a key influence of a number of dental material and equipment manufacturers. Gavin Pearson trained as a dentist at UCL Dental School. In 1969 he was appointed as a lecturer in Conservative Dentistry at UCL Dental School and subsequently at the London Hospital Medical College Dental Institute. During this time he carried out work on the early composite filling materials. He was appointed Senior Lecturer/Hon Consultant in Restorative Dentistry at UCL in 1979 and in 1987 he became Head of Biomaterials at Eastman Dental Institute and Hon Consultant in Restorative Dentistry. He was appointed Reader in 1990 and was awarded a personal Chair in Biomaterials in 1996. He became head of Biomaterials in relation to Dentistry at QMUL in 1999 and was also Associate Director of the Interdisciplinary Research Centre in Biomedical Materials at QMUL until his retirement in 2006. He has collaborated on a number of research projects with dental manufacturers. His research has concentrated on the clinical problems associated with dental material and has been involved in the research and development of minimally invasive techniques using antibacterial PDT and glass ionomer cements. He has published over 140 peer reviewed papers. He has been associated with the University of Bristol Open Learning for Dentistry [BUOLD] courses since their inception in 1990. He has lectured in both the US and Europe and has been the UK Principle Expert on Glass Ionomer Cements at a number of ISO meetings.